Phytochemicals are compounds in foods found in plants that are thought to be beneficial to health. More than 5000 different types have been identified, and several studies have linked their intake to reduced risk for cardiovascular disease, cancer, diabetes, Alzheimer’s, cataracts, and age-related decline. While they may be beneficial, they are not considered nutrients (substances necessary to sustain life), thus no daily recommended intakes have been established. A list of five popular phytochemical families are listed below, along with their health claims and food source. Includes: Alpha-carotene, beta-carotene, lutein, lycopene, zeaxanthin, etc. A dog searching for a lost child is typically given an item of clothing to smell. But what does that scent “look” like? To find out, scientists tested 48 dogs, half of which had special police or rescue training. In a laboratory room, the scientists slid each dog’s favorite toy across the floor to a hiding place, while the dog waited in another room. One researcher then brought the dog to the testing room and pointed at the starting point of the odor trail and told the dog, “Look for it! Bring it!” In one trial, the dog found either its favored toy or a different item. A promising new drug called baloxavir marboxil (Xofluza) developed in Japan has been shown to stop the flu virus from spreading 24 hours after intake. The drug interferes with influenza A and influenza B's main replication process instead of inhibiting the neuraminidase enzyme, as accomplished by previous drugs such as oseltamivir (Tamiflu) and zanamivir (Relenza). 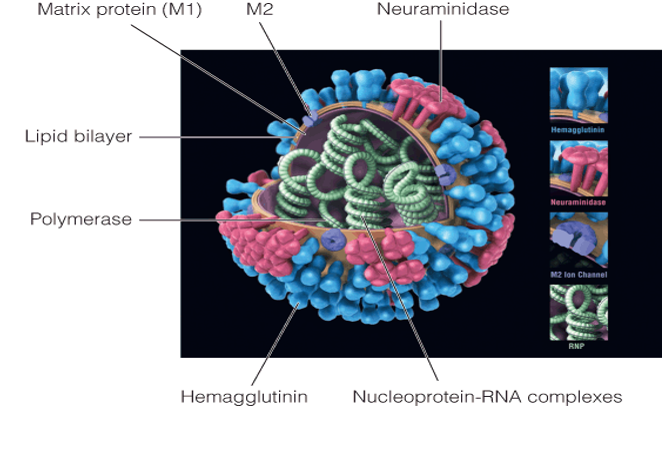 As shown in the illustration, viral neuraminidase sits on the surface of influenza viruses and enables it to be released once reproduced within the infected host cell.